The physicians of the Center for Joint Preservation and Replacement are elected members of the highest ranking body of the orthopedic profession, the American Academy of Orthopedic Surgeons. They have extensive postgraduate training, are board certified, hold numerous academic appointments and have a combined experience that exceeds 75 years in the treatment of all types of joint degenerative disease and arthritis. As leaders in their field, these physicians are recognized for their academic contributions to orthopedic surgery. The Center for Joint Preservation and Replacement team includes a highly skilled and dedicated group of nurses, OR staff, nurse practitioners, physician assistants, social workers, physical therapists, rehabilitation physicians, pain management specialists, fellows and residents. The physicians of the Center for Joint Preservation and Replacement pride themselves on treating every patient like a member of their own family. They are enthusiastic about spending time educating patients and their families so they can be actively involved and informed in making medical and surgical decisions. Our goal is for patients to understand how to preserve their own joints, cartilage and tissues so they can avoid potential deterioration in the future. Each physician is committed to serving their patients with dedication, energy, kindness and empathy. Ronald E. Delanois, M.D., is a board-certified, fellowship-trained orthopedic surgeon who brings more than 20 years of experience with complex hip, knee and shoulder reconstructive surgery to the Rubin Institute for Advanced Orthopedics. His emphasis is on the diagnostic, arthroscopic and joint-preserving procedures affecting these joints. Barry J. Waldman, M.D., serves as co-director of the Center for Joint Preservation and Replacement at Sinai Hospital. He works to develop innovative techniques in the surgical treatment of arthritis and perioperative care. James Nace, D.O., M.P.T., F.A.O.A.O., is a board-certified, fellowship-trained orthopedic surgeon specializing in hip, knee and shoulder joint preservation and reconstruction. He is proficient in the most modern nonoperative and operative treatments such as minimally invasive surgery, arthroscopy, primary and revision hip, knee, shoulder replacement surgery, and general orthopedic care including fractures and sprains. 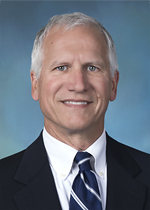 Robert M. Peroutka, M.D., is a board-certified, fellowship-trained orthopedic surgeon who brings more than 28 years of experience to the Rubin Institute of Advanced Orthopedics. He specializes in adult hip and knee joint preservation and reconstruction.